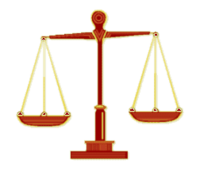 A balancing scale, commonly associated with law and justice. Battery is the intentional and offensive or harmful contact with another person. The exact definition varies by jurisdiction. In criminal law the elements of battery are physical contact that causes harm or offensive contact without that person's consent. Battery is often confused with assault which is threatening battery. Battery is when the threat (assault) is carried out and the person is harmed in some way. Criminal battery and civil battery may be the same or differ slightly depending on jurisdiction. In many cases the act of battery can result in both criminal and civil liability. Civil battery is a tort. It is a wrong committed against another person that results in damage. It is also called an intentional tort. In most cases they are the result of negligence, caused by carelessness or recklessness. The person on whom the battery was committed, the victim, may bring a lawsuit in court to collect monetary damages. Touching which is harmful or offensive. Contact was to the victim's person. Intent, that the act was deliberate. Causation, that something happened as a result of the act. If all four elements can be proved, a prima facie case exists to go ahead and prosecute the offender. In most cases the civil lawsuit follows a criminal trial. A person found not-guilty in a criminal trial does not prevent the victim from filing a civil suit. The burden of proof is usually lower in a civil court than in a criminal court. The use of force that is unauthorized or unlawful. Battery to the person of another. There is a physical injury or touching in an offensive manner. The use of a deadly weapon. Cases where the result is serious bodily injury. Battery is committed against a vulnerable person: a child, an elderly person, or a pregnant woman. Battery committed against police officer is it usually considered aggravated battery. ↑ "Battery Basics". FindLaw. Retrieved 19 November 2015. ↑ "Battery". Cornell University Law School. Retrieved 19 November 2015. ↑ 3.0 3.1 3.2 3.3 3.4 3.5 "Assault and Battery: Civil vs. Criminal Cases". NOLO. Retrieved 19 November 2015. ↑ 4.0 4.1 "Battery Law". HG Legal Resources. Retrieved 19 November 2015. ↑ 5.0 5.1 "Simple Battery". LegalMatch. Retrieved 19 November 2015. ↑ 6.0 6.1 "What is aggravated battery?". Advice Company. Retrieved 19 November 2015. This page was last changed on 21 February 2019, at 18:19.